The academic literature has tried to rationalise these views on the grounds of some sizable market imperfection specific to traded goods, in particular manufacturing– in the presence of positive externalities in this industry, the absence of policy intervention leads to an inefficiently low industrialactivity level and, subsequently, slow growth. Given the traded nature of manufactures, a real depreciation can be understood as a subsidy that remedies the under-provision of industrial output through an increase in exports (Rodrik 2008). Although there is some empirical evidence suggestive of the positive effect of depreciations on the growth rate of GDP per capita, it is not conclusive. This type of econometric analysis, based on aggregate variables, is plagued with endogeneity issues (Woodford 2008) and is not particularly informative about the economic channels through which a depreciated real exchange rate leads to a higher growth rate. Moreover, regardless of how successful development strategies based on real undervaluation may have been in the past, there are reasons to believe that their effectiveness, even their convenience, may vary over time and across countries. Production of manufacturing (final) goods after WWII used to employ mostly intermediate inputs produced locally. Nowadays, production in the manufacturing industry is instead based on global value chains (GVCs) that slice and distribute the value-added chain internationally; besides, the degree of firms’ integration into GCVs varies across regions (Baldwin 2016). 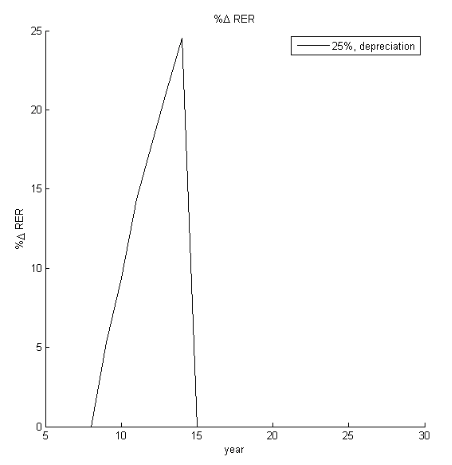 What are the effects of real depreciations in this new scenario? In a recent paper, we focus on the microeconomics of firm-level responses to real exchange rate fluctuations(Alfaro et al. 2018). We use data on manufacturing firms from countries that are differently integrated into GVCs and focus on productivity growth and research and development activity. This approach provides a much more detailed picture of the effects of real depreciations on growth and, at the same time, sheds light on the mechanism underlying this relationship. Our arguments are based on a number of key empirical findings, which we subsequently use in the theory part of our paper. 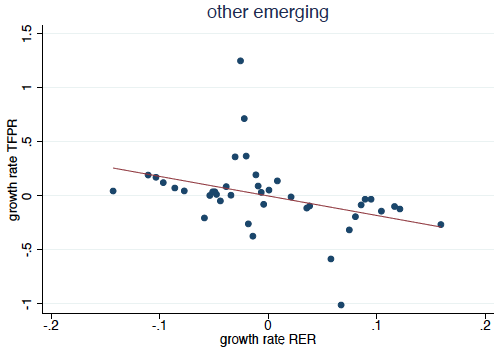 Manufacturing firms from emerging Asia experience positive effects of real depreciations on their revenue productivity (TFPR) growth and R&D activity, whereas firms from other emerging countries (Eastern Europe and Latin America) experience negative effects. Industrial-country firms do not react much to real depreciations. It is the exporting firms that experience the positive effects from real depreciations on their productivity growth and R&D activity; importing firms suffer negative effects. Firms from emerging Asia are much more export oriented than firms from other emerging countries relative to their import orientation. Industrial-country firms lie in between these two groups in this regard. With these empirical findings in mind, we structurally estimate a dynamic model in which changes in productivity are not the result of externalities but of firms’ deliberate decisions. In particular, we model R&D investment by heterogeneous firms that can also choose to export their output and import intermediate inputs. Since R&D investments are large, sunk, and intangible, they are hard to finance from external sources– credit-constrained firms in financially underdeveloped countries use their profits as a source of funding for their innovation activities. 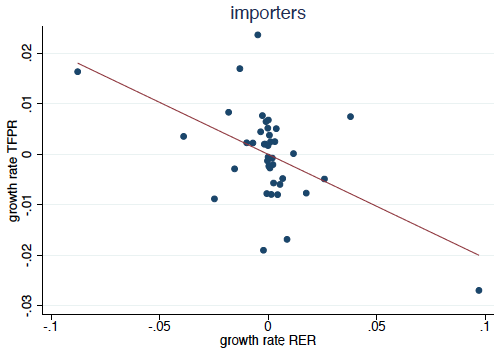 Real depreciations have different effects on the profits of firms according to their trade status– they raise the market shares and profits of exporters, and reduce them for firms that import a sizable share of their inputs, as their costs rise. Subsequently, exporting firms’ R&D activities are enhanced by depreciations, whereas importing firms reduce their R&D during depreciations. We allow for differences in the structural parameter estimates among the three regions we distinguished above. 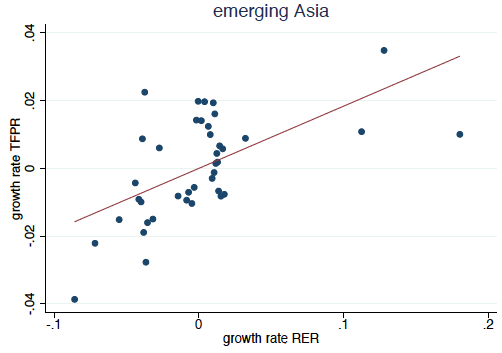 The differences in average relative trade status of (export-oriented) firms from emerging Asia and (import-oriented) firms from other emerging markets aggregate these heterogeneous firm-level responses into the different average effects of real-exchange-rate fluctuations on R&D and productivity growth we mentioned earlier. Industrial-country firms do not react much to real exchange-rate changes for two reasons—they have a more balanced average trade status, and are much less credit constrained than firms in emerging markets. 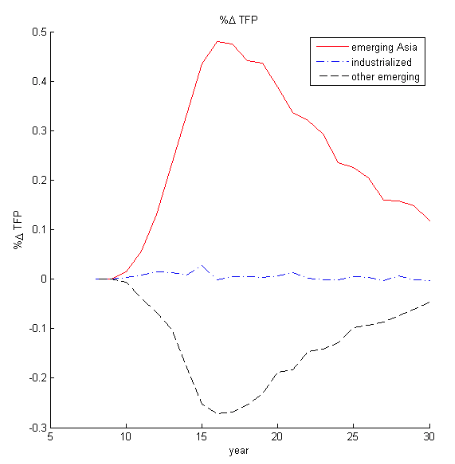 Our simulations show that a temporary one-standard-deviation depreciation of the real exchange rate over a five-year interval (around 25%) raises medium-run average firm-level physical total factor productivitygrowth by 0.5 percentage points in emerging Asia and reduces it by 0.3 percentage points in other emerging economies. By contrast, the average industrialised-country firm does not react significantly to such a shock. The figure below displays the time paths of physical total factor productivity for the average firm in our three different regions (right panel) that result from the counterfactual depreciation (left panel – 25% real exchange rate depreciation over a five-year interval). Our simulation shows that a relatively short-lived real depreciation has persistent effects – changes in physical productivity resulting from changes in R&D investment after the temporary depreciation are found to be much more long-lasting than the latter. This is explained by the sunk nature of R&D investments and the long memory of the stochastic process governing physical total factor productivity. By contrast, changes in other variables (exports, imports, etc.) disappear as soon as the real exchange rate moves back to its long-run average. A number of policy-relevant conclusions arise from these results. 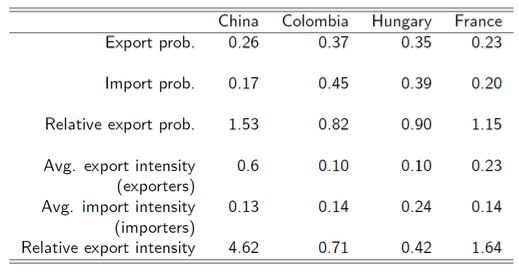 First, as opposed to conventional analysis, the effects of real exchange-rate fluctuations on the manufacturing sector depend on the average firm’s export and import participation. Hence, cross-country differences in the degree of firms’ integration into GVCs are a key factor in our understanding of the implications of real undervaluation. Second, as GVCs evolve or the degree of integration of a country’s firms into them changes, the effects of real exchange rate fluctuations, and thereby countries’ optimal policies, might change over time. 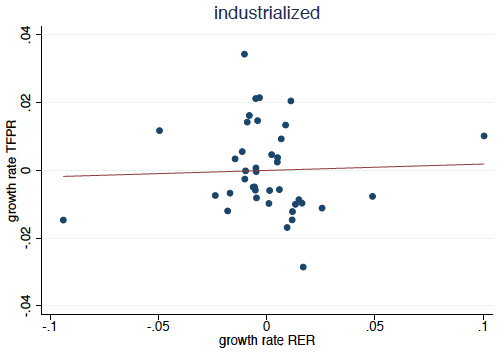 Finally, a deeper integration of firms into GVCs that makes them both export their output and import intermediates is likely to reduce the effectiveness of real undervaluation as a policy tool, as effects operating in opposite directions will cancel each otherout, as is already the case for industrial-country firms. Alfaro, L, A Chari and F Kanczuk (2017), “The real effects of capital controls: Firm-level evidence from a policy experiment,” Journal of International Economics 108: 191–210. Alfaro, L, A Cuñat, H Fadinger and Y Liu (2018), “The real exchange rate, innovation and productivity: Regional heterogeneity, asymmetries and hysteresis,” NBER, Working Paper 24633. Blackden, R (2012), “Brazil President Dilma Rousseff blasts western QE as 'monetary tsunami',” The Telegraph, 12 April. Edwards, S (1989), Real Exchange Rates, Devaluation and Adjustment in Developing Countries, MIT Press. Eichengreen, B (2008), “The real exchange rate and economic growth,” World Bank, Commission on Growth and Development Working Paper no 4. Kroeber, A R (2011), “The renminbi: The political economy of a currency,” Foreign Policy, 7 September. Rodrik, D (2008), “The real exchange rate and economic growth," Brookings Papers on Economic Activity 2: 365–412. Sachs, J (1985), “External debt and macroeconomic performance in Latin America and East Asia,” Brooking Papers on Economic Activity 2:523–573. Woodford, M (2008), “Comment,” Brookings Papers on Economic Activity 2: 420–437. Recent international tensions are symptomatic of these conventional views. Several Latin American and Asian governments reacted to the quantitative-easing policies of the US and the euro area by implementing capital controls in order to stem capital inflows and thereby prevent the appreciation of their exchange rates. However, these controls are viewed by the US and the euro area as implicitly protectionist and aimed at maintaining a persistent undervaluation (Blackden 2012, Alfaro et al. 2017). The binned scatter plots show means of annual firm-level TFPR growth rates computed for each percentile of the distribution of this variable, plotted against means of the real exchange rate growth rate for each of its percentiles (considering 40 bins of both variables) after partialling out country-sector and year fixed effects and business cycle controls. The plots are based on a sample of around 1.3 million yearly observations corresponding to 500,000 manufacturing firms for the period 2001–2010. 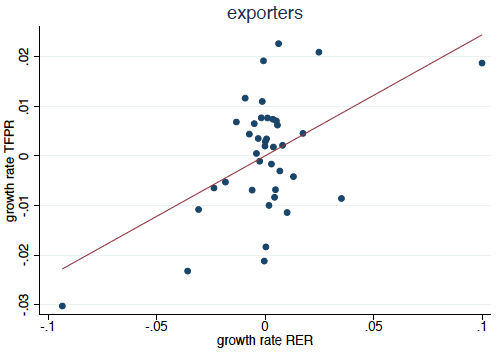 The binned scatter plots partial out country-sector-year fixed effects and firms’ export and import status. A similar picture arises for emerging Asia and other emerging markets from the World Bank’s Enterprise Survey, which does not cover industrialised countries.